In our homeland's case, we can not afford a "balanced" approach to history since in the past and present years, our homeland's history, as it refers to Philippine-US relationships, has been imbalanced in favor of the Americans, who as far as we baby boomers can remember, are only "the good guys" and "do-gooders" in history. 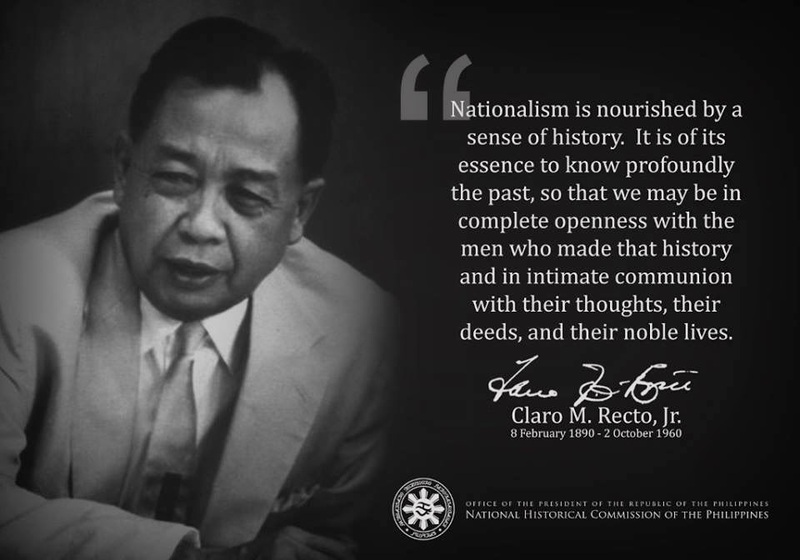 It is time for us, especially for Filipinos-in-the-Philippines to recover our history, a nationalist history, which necessitates uncovering the lies and myths about America; since the American arrival into and 50-year occupation of our homeland, the sweet nothings about "Philippine-American Special Relations", etc. perpetuated through our school textbooks, mass media, government pronouncements, and Filipinos with Americanized minds, etc. Editor's note: In the spring and summer of 1898 the United States thrust itself into the global power game with a 10-week victory in the Spanish-American War. "The three political musketeers who did the most to bring it on," noted historian Samuel Eliot Morison '08, Ph.D. '12, in Three Centuries of Harvard, were Harvard men: William Randolph Hearst (ejected as a sophomore, in 1883, for sending personalized chamber pots to his professors); Henry Cabot Lodge, A.B. 1871, LL.B. 1874, Ph.D. 1876; and Theodore Roosevelt, A.B. 1880. Hearst's chauvinistic newspaper shocked readers with lurid accounts of Spain's cruel treatment of Cuban insurgents; Senator Lodge of Massachusetts and Assistant Secretary of the Navy Roosevelt browbeat peaceable President William McKinley into intervening in Cuba's civil war. Concern in the United States over Latin American politics had been heightened by the Venezuela-British Guiana border dispute of December 1895, when President Grover Cleveland sent a tough warning to Britain: "Today the United States is practically sovereign on this continent, and its fiat is law upon the subjects to which it confines its interposition." Cleveland's challenge set off a brief war scare, to the gratification of Theodore Roosevelt, who had just left the U.S. Civil Service Commission to become New York City's police commissioner. "Let the fight come if it must," TR wrote his good friend Henry Cabot Lodge, then in his first term in the Senate. "I don't care whether our sea-coast cities are bombarded or not; we would take Canada...Personally I rather hope the fight will come soon. The clamor of the peace faction has convinced me that this country needs a war." Three months later Roosevelt wrote to another friend, "It is very difficult for me not to wish a war with Spain, for such a war would result at once in getting a proper Navy." By then the "yellow press" had turned the nation's attention to Cuba, where guerrillas had struggled against Spanish provincial government forces for more than a year. New York City's first mass-circulation newspapers, William Randolph Hearst's Journal and Joseph Pulitzer's World, were cramming their pages with sensational reports of Spanish atrocities (many based on accounts confected by Cuban-American lobbyists in New York and Washington). Proponents of intervention were speaking out. Most shared the expansionist views of navy captain Alfred Mahan, an exponent of sea power. To Mahan, the overriding question for Americans was "whether Eastern or Western civilization is to dominate throughout the earth and to control its future." Harvard had honored Mahan with an LL.D. at the Commencement of 1895; Roosevelt and Lodge were among his disciples. Cuban intervention became a campaign issue in the 1896 presidential election, in which Ohio governor William McKinley--billed as "the advance agent of prosperity" by the Republican Party--defeated Nebraska congressman William Jennings Bryan. Roosevelt campaigned vigorously for McKinley, who reluctantly agreed to make him assistant secretary of the navy. ("He is too pugnacious," McKinley objected; "I want peace.") Secretary of the Navy John D. Long, A.B. 1857, LL.D. 1880, a former governor of Massachusetts, warned that TR "would dominate the department within six months." Long's prediction proved to be accurate. Two months earlier Roosevelt had instructed Commodore George Dewey, commanding the navy's Asiatic squadron in Hong Kong, to prepare to engage Spain's small fleet in the Philippines. TR now withdrew from the navy department, ordered a blue lieutenant colonel's uniform from Brooks Brothers, and assumed deputy command of the First U.S. Volunteer Cavalry, which he named the "Rough Riders." The regiment's commander was a warm friend, Colonel Leonard Wood, M.D. 1884. A former frontier military surgeon and Indian fighter, Wood was also President McKinley's personal physician. U.S. warships from Admiral William T. Sampson's Atlantic flotilla blockaded Havana's harbor. On May 1, six ships commanded by Commodore Dewey steamed into Manila Bay and destroyed all 10 ships of the Spanish Pacific fleet. McKinley sent troops to occupy the Philippines and approved the mobilization of forces in Tampa, Florida, to invade Cuba. On July 1, in the only major fighting of the campaign, American troops assaulted a small contingent of Spanish gunners near Santiago and won a precarious victory. Roosevelt's Rough Riders took the heaviest losses of any American unit, and TR's headlong gallop up San Juan Hill became the most celebrated feat of the war. As Professor Morison wrote, it promoted him "from a colonelcy to the presidency." "how do you like the Journal's war?" Hearst's sassy paper asked readers in May. It was obvious that Hearst liked it enormously. The 35-year-old enfant terrible of American newspaper publishing had acquired the floundering Journal a few months earlier. Now it was selling a million papers a day and feeding Hearst's giant ego by proving the political power of modern news media. "Under republican government," Hearst would write in September 1898, "newspapers form and express public opinion. They suggest and control legislation. They declare wars. They punish criminals, especially the powerful. They reward with approving publicity the good deeds of citizens everywhere. The newspapers control the nation...." Hearst and Joseph Pulitzer were arch-rivals, but their papers worked side by side to promote the war. Opinion at Harvard was divided. President Eliot's name led a list of 86 faculty members opposed to intervention in Cuba. Eliot's cousin Charles Eliot Norton, A.B. 1846, professor of the history of art, condemned the impending war as needless, inglorious, and criminal. Local politicians suggested that Norton be tarred and feathered. Citing Benjamin Franklin's dictum that "there never was a good war," Norton told a Cambridge church group that war "is evil in itself, it is evil in its never-ending train of consequences....If a war be undertaken for the most righteous end, before the resources of peace have been tried and found vain to secure it, that war has no defense; it is a national crime." Norton's stance angered his classmate George Friskiness Hoar, senior senator from Massachusetts. "All lovers of Harvard," Hoar wrote Norton, "and all lovers of the country, have felt for a long time that your relation to the University made your influence bad for the college and bad for the youth of the country." Supreme Judicial Court justice Oliver Wendell Holmes Jr., A.B. 1861, LL.B. 1866, LL.D. 1895, thrice wounded during the Civil War, regarded the antiwar rhetoric coming out of his alma mater as "self-righteous and preaching discourse" and called for "some rattling jingo talk." "Don't yelp with the pack!" the revered William James, professor of philosophy and psychology, advised his students. But a hundred or so left to join the army, the navy, or the hospital corps. Drill squads practiced behind the gymnasium and on Soldiers Field. Patriotic undergraduates kindled bonfires and sang the war's theme song, "There'll Be a Hot Time in the Old Town Tonight!" On the eve of the Fourth of July, four Spanish warships tried to run an American naval blockade of Santiago harbor. They were driven ashore by the U.S. Atlantic flotilla. Santiago surrendered a fortnight later. General Nelson Miles, LL.D. 1896, left to lead an unauthorized invasion of the Spanish island of Puerto Rico. Spain sued for peace in late July. Ambassador John Hay, writing from London to Theodore Roosevelt, declared that from start to finish it had been "a splendid little war." The Treaty of Paris, signed in December, transferred much of Spain's dwindling empire to the United States. Congress's war resolution had renounced U.S. claims to Cuba, but the island remained under military rule for more than three years, and the navy retained a large base at Guantanamo. Puerto Rico, the Philippines, and Guam became U.S. dependencies. Expansionist zeal had led Congress to annex Hawaii in July, and in 1899 the United States and Germany would divide the archipelago of Samoa. America was now a major stakeholder in the Far East. Rejecting the imperialism of Roosevelt, Lodge, and Hearst, a vocal group of American educators, writers, and political leaders opposed the ratification of the treaty. Among them were President Eliot, William James, and Stanford president David Starr Jordan; Mark Twain and the writer and educator William Vaughn Moody, A.B. 1893; former President Grover Cleveland, presidential aspirant William Jennings Bryan, and--despite his stinging reproof of Professor Norton--Senator George Frisbie Hoar. After what Lodge described as "the closest, hardest fight," the Senate approved the peace treaty by a single vote. Expulsion from the Western Hemisphere was a stunning blow to Spain's honor, and was remarkably costly in human terms. From the start of the Cuban insurrection to the end of the Spanish-American War, some 53,440 Spaniards died of yellow fever or other diseases, another 8,627 died of wounds, and 786 were killed in combat. Close to 30,000 were captured. The loss of almost 63,000 lives was nearly 30 percent greater than America's losses in Vietnam three-quarters of a century later. On the American side, some 5,509 regulars and volunteers died of infectious diseases, 202 died of wounds, and 496 were killed in action. Leonard Wood was promoted to brigadier general and named military governor of Cuba in 1899. He dealt tactfully with disgruntled rebel leaders, worked to improve squalid living conditions, built schools and roads, and tried to reform corrupt governmental and legal systems. When the island was hit by an epidemic of yellow fever, Wood put Dr. Walter Reed in charge of a four-man team of army physicians who discovered the etiology of the disease and eradicated it in a year. In the Philippines the United States got more than it expected. Under the Treaty of Paris, Spain gave up the islands for $20 million. Within weeks, Filipino insurgents and U.S. occupation forces were locked in a shooting war. It took 63,000 troops, 4,300 American deaths, and almost three years to crush the revolt. "The planting of liberty--not money--is what we seek," insisted General Arthur MacArthur, the American commandant. But in the new global power game, America's acquisition of the Philippines was a preemptive move against Russia, Germany, and other European powers with colonial aims in the Far East. Manila was also an entrepôt for trade with Japan and China. "Within a few years we have seen Russia closing in upon the Chinese Empire," Senator Lodge explained to a Boston audience in 1899. "If she succeeds we shall not only be excluded from those markets, but we shall stand face to face with a power controlling an extent of territory and a mass of population the like of which the world has never seen. In the presence of such a colossus of despotism and military socialism, the welfare of every free people is in danger." ...We cannot be unmindful that without any design or desire on our part the war has brought us new duties and responsibilities which we must meet and discharge as becomes a great nation, on whose growth and career, from the beginning, the Ruler of Nations had plainly written a high command and pledge of civilization. Incidental to our tenure in the Philippines is the commercial opportunity to which American statesmanship cannot be indifferent. It was surely true that most Americans and their leaders had not foreseen what intervention in Cuba might lead to. But some had. En route from Tampa to Cuba, Leonard Wood had written his wife, "Hard it is to realize that this is the commencement of a new policy and that this is the first great expedition our country has ever sent oversea [sic] and marks the commencement of a new era in our relations with the world. For all the world the ocean reminds one of dear old Vineyard sound...."
Roosevelt, Lodge, and their circle knew that defeating Spain would make the United States a world power. Every aspect of the victory advanced their interests. The work of Dewey and Sampson bore out Mahan's theories about the critical role of naval power in modern warfare. The battleship Oregon's 71-day voyage around Cape Horn en route to the Far East dramatized the strategic need for of a canal through the Central American isthmus. Roosevelt's role in the war accelerated his political career. The influence of Hearst's and Pulitzer's papers demonstrated the power of news media to shape public opinion. And as the twentieth century unfolded, American presidents would follow the Cuban intervention of 1898 with "peace-keeping" actions in Cuba, Mexico, Nicaragua, Vietnam, Grenada, Panama--even the Persian Gulf. About 350 Harvard men, including a hundred or so undergraduates, had volunteered for the war. Ten died in service--six from typhoid fever, two from yellow or malarial fever, one from dysentery, one from an accident. All but one died after the fighting was over. Three were Rough Riders: Stanley Hollister, A.B. 1897, a first-year law student; William Sanders, A.B. 1897; and a rising junior, Nathan Adsit '00. Hollister was wounded at San Juan Hill. Sherman Hoar, A.B. 1882, a nephew of Senator George F. Hoar who had volunteered for medical relief work, was a civilian casualty. As an undergraduate he had been the model for Daniel Chester French's statue of John Harvard. The roll of the dead appeared in the Harvard Bulletin's initial issue, published November 7, 1898. Among the honorary degree recipients at the Commencement of 1899 were General Wood ("Army surgeon, single-minded soldier, life saver, restorer of a province") and Admiral Sampson ("An officer foresighted, forearmed, ready at every point, the American expert in high command"). In collaboration with Wood, President Eliot arranged a summer session for more than 1,200 Cuban teachers, who arrived in Cambridge at the beginning of July. The president, who usually summered in Northeast Harbor, Maine, stayed in Cambridge to oversee the program, housing four of the visitors in his own home. A similar session was later held for teachers from Puerto Rico. Fair Harvard's peace is o'er the world once more. John T. Bethell '54 is senior editor of this magazine. Harvard Observed, his history of the University in the twentieth century, has just been published by Harvard University Press.